Uuh-uh, already Friday afternoon… Here is another quick, almost uncommented Sankey diagram, just to not leave you without one for the weekend. 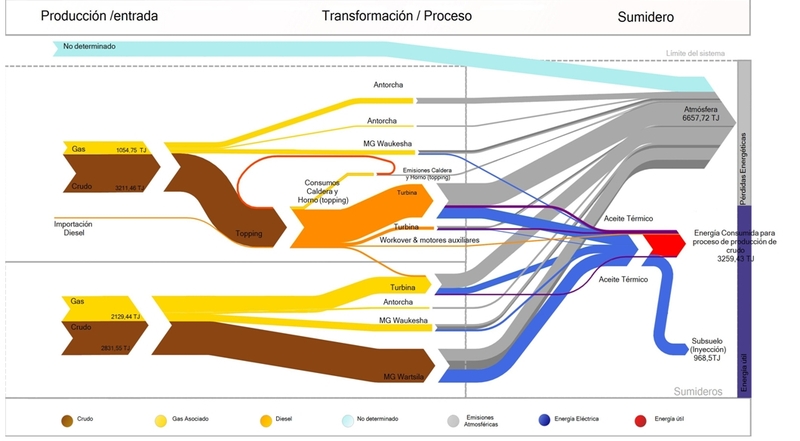 Argentinian environmental consultancy and engineering firm Neoambiental uses this Sankey diagram on its website (go to section 4) to market their professional experience in energy efficiency studies. Flows are in TJ. Feedstock is crude (brown arrows) and associated gas (yellow). Grey flows are losses or unused energy, while red represents the actual used energy.